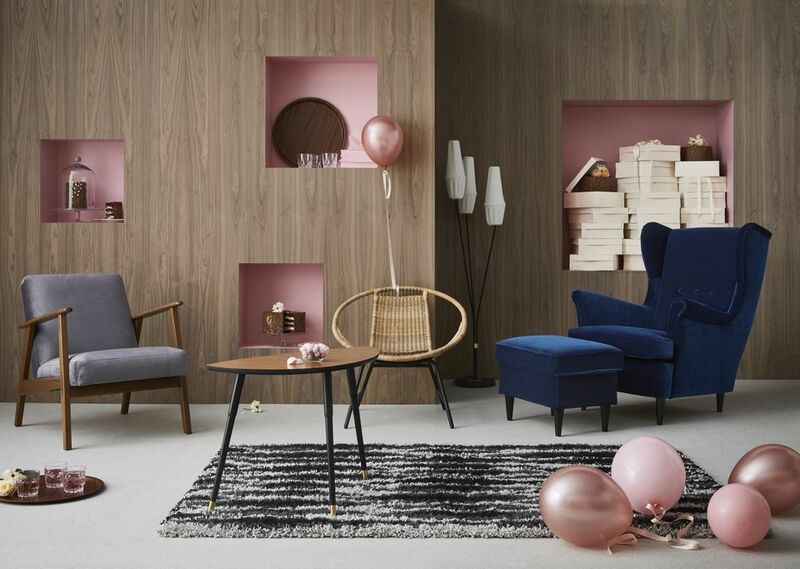 Ikea is bringing back some old favorites to celebrate their 75th anniversary with the release of the limited edition vintage collection “Gratulera”. The collection features a selection of their most popular products from three different time periods, set to release on three separate dates. The products inspired by the 50-60’s will be available in August, followed by the 70-80’s in October, and the 90-00’s in December. The three selected decades represent key timeframes in Ikea's history, from when they developed from a small Swedish mail order business to a popular international home furnishing retailer. They also just happen to be eras that embraced fun lamps, retro patterns, bright colors, and cane furniture, so we are totally here for it! Ahead of the first release, we chose the 12 items we can’t wait to get in our homes. This chair was featured on the cover of the first Ikea catalogue in 1951, under the name MK. Then described as giving "royal comfort," this vintage throne comes flat-packed and in a variety of color options. It would be almost impossible to buy the Strandmon Wing Chair without it's matching ottoman. With room for storage, this ottoman is as useful as it is adorable. This leaf-shaped side table comes with a story. When Gillis Lundgren, Swedish furniture designer and early Ikea employee, first tried to fit the original table into a small car, but couldn't, the idea of flat-pack was born. Perfect as a statement piece, this elongated floor lamp has cotton lamp shades that give diffused mood lighting. Who doesn't love a good rattan armchair? This one looks perfect for autumn weekend reading. This retro hanging lamp is perfect for adding a pop of yellow to wake up any room. There's nothing like a glass display cabinet to keep your clutter in check. This tall 3-tier cabinet will force you to keep your knick-knacks in order. Coming in all three primary colors, red, blue and yellow, this removable couch cover makes it super easy to clean up after a spill. Not sure what color to get? Try all three and switch it up whenever the mood strikes. We can imagine many hot drinks and long conversations over this rectangular coffee table. A versatile purchase, the cubby hole can be used for storage, leaving the table top free for drinks, food, or indoor plants. Because you can never really have too many cushions! Coming in either black or red, the Sippruta Cushion Cover is perfect for retro decor lovers. This wiggly patterned rug is the perfect gateway for decorating your home with black . Place it in a white room for a dramatic statement piece. If your storage bench doesn't come with a cute optional wheel action, is it even worth having? We see this being handy for storing winter woolens and knitwear or toys (and did we mention it has cute wheels?). How Well Does the IKEA Billy Bookcase Work?